Windows Server 2016 introduces native Virtual Machine load balancing. The idea being that Server 2016 Cluster Manager will now migrate VM’s to other Hosts in the cluster to level out the work load. This is roughly the same as “Dynamic Optimization” in System Center Virtual Machine Manager but this is free. By default Microsoft does not want Server 2016 to move VM’s to different nodes unless one of the nodes is ‘hammered’. In fact, the default configuration is to do nothing until one of the nodes hits 80% capacity. Fortunately this is easy to change and we recommend changing the BALANCER setting to HIGH. As you can see in the table to the right, if you set the balancer to HIGH, it will move VM’s that are on hosts that are more than 5% busier than other nodes. 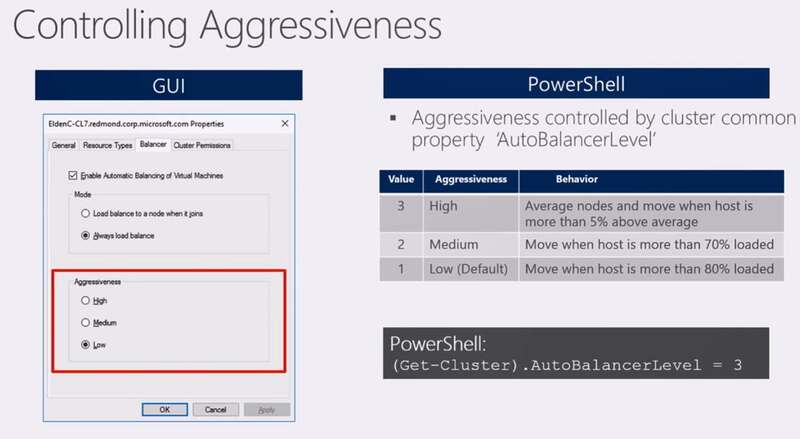 The graphic to also shows you the PowerShell to change the load balancer settings. The big limitation here is that you cannot select which nodes to load balance and which ones to leave alone. This is one feature that is still only in SCVMM Dynamic Optimization. Something else to keep in mind is that Server 2016 has Load Balancing enabled by default, but you can turn it off if you want. 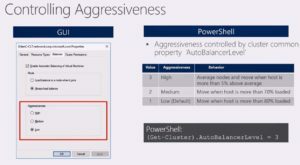 If you are using SCVMM Dynamic Optimization, it will connect to your VM’s and disable the built in Server 2016 load balancing so there is no conflict. SOLVED: Where Should The Windows Page File Go?